Russell Crowe, Cate Blanchett, and William Hurt star in a film written by Brian Helgeland and directed by Ridley Scott. Russell Crowe brings his trademark grit and gravitas to the role of Robin Hood in Ridley Scott’s take on the titular folk hero’s beginnings. Yes, Robin Hood and his band of merry criminals are back on the big screen, in theaters everywhere. But forget, for the moment, about chaps in brightly colored tights, the fair maiden Lady Marion, the tipsy Friar Tuck, and Errol Flynn-featured romps around Lake Sherwood passing for Nottingham. Ridley and Russell are in town, and they’re coming to shake up the franchise—and our preconceptions. 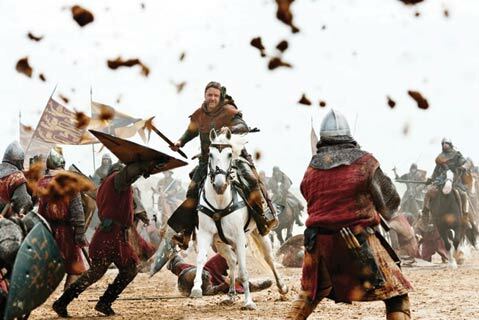 Working from Brian Helgeland’s intriguing script about the circumstances of corruption in medieval England leading to the creation of the rebel Robin Hood, Ridley Scott draws on his well-established skills as an atmospheric filmmaker and storyteller. As he did with his best films, from Blade Runner to Black Hawk Down, Scott relishes the keen blend of grit and grandeur afforded by this battle-fortified tale with vast, period piece-correct sets and landscapes. And he’s got the right next-generation Robin in Crowe, who brings gravitas and lone-wolf heroism to this role. Crowe is a Robin Hood with a ferocious will to do right and a soft heart. Casting-wise, the Scott version certainly also benefits from the presence of Cate Blanchett, Max von Sydow, and William Hurt. Call this film Robin Hood, the Prequel. As a friend to King Richard the Lionhearted (Danny Huston) and a foe to Richard’s decadent, taxing-crazed brother King John, the seeds for Robin Hood’s transformation into rebel robber with a cause are duly sown here. But enjoyable as it often is, something feels wobbly and uneven about the film. John Mathieson’s cinematography is striking in ways large and small, taking in the vastness of settings and the blood and dirt of the ground-level action. But Marc Streitenfeld’s musical score is almost comically overwrought, working against the visceral you-are-there visual element. The film’s historical-epic duration is overly epic by about a half hour, and our links to the characters waver between empathy and disbelief born of Hollywood hokum. Maybe the sequel to the prequel will be better, once the “robbing from the rich” and prancing in Sherwood Forest part begins in earnest.